After debating it for awhile I decided that, although you'd ideally want to drop something similar to an anti-Cryx list against the Cephalyx contract, their inclusion in Mercs makes that a much trickier proposition. I feel like Thexus is likely to show up alongside one of their colossal 'casters (either Bart/Galleon or Ossrum/Earthbreaker.) Unless you feel confident about your anti-Cryx list fighting one of those monster colossal lists (and I don't,) I think that you end up with a bit of list chicken. In this case I decided that I wanted to see how well Irusk2 could do against the Cephalyx, to see if I'd absolutely need to try and guess correctly during list selection, or if he can play through it. Will things work out for Irusk2? Will Thexus float onto victory? Will Shield Wall actually ever factor into this game? Answers to all that and more after the break! This list is unchanged from the last time I used it. I still like this list, though Conquest and the un-Valachev'd TAC were a slight pain to work with. I wanted to get more experience with both before making any changes. Likewise, this list is unchanged from the last time I faced it. Point of fact, it hasn't changed at all since my friend hit upon this combination of models, and I can't blame him. Its an excellent combination of support, denial, shenanigans, and work. Also of note: this time we remembered to use Deathclocks! Not the most forgiving armies for a timed format, but it's great practice. Thexus wins the roll off and opts for first turn. 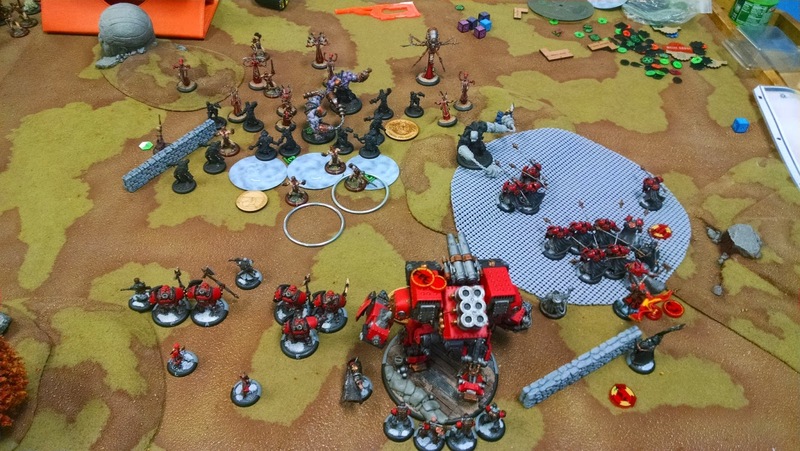 Thexus' army does the usual first turn run, with everything hoofing it up the table. Thexus advances up behind everything and puts up Deceleration for protection. Irusk's army moves more conservatively. The IFP and Shocktroopers both Shield Wall forward under the effect of Shield March. Irusk casts Fire For Effect on Conquest and Tactical Supremacy on the Widowmakers, then moves behind the nearby wall. The TAC move up behind the wall as well. The Widowmakers advance and shoot into the advancing Drudge line, forcing a couple of Tough checks and a casualty. Conquest advances and shoots one of the TAC, hitting (no critical) and leaving it with one health remaining. The Secondary Batterys lay down Creeping Barrage templates. The Eliminators move up behind the Shocktroopers. End of turn, Tactical Supremacy triggers allowing the Widowmakers to shuffle backwards 3". Thexus allocates one to each Wrecker, keeps the rest. The TAC lead off by advancing and putting up their cloud wall. Most of the army piles in behind that, including Thexus who puts up Deceleration again and TKs the Wrecker into the zone. A few Drudges run through the Creeping Barrage, with no damage caused. Both Machine Wraiths run forward to jam. The left one ties up two Widowmakers while the right one plops itself down in front of the IFP (threatening freestrikes if any go past.) The right Pistol Wraith repositions into the forest, while the left one advances up behind the wall and picks off one of the Widowmakers. Irusk allocates no focus, upkeeps FFE, lets Tactical Superiority drop. The TAC start off the turn by advancing to get out of Irusk's way and throw out some Flame Blasts that force a Tough check on a Drudge. 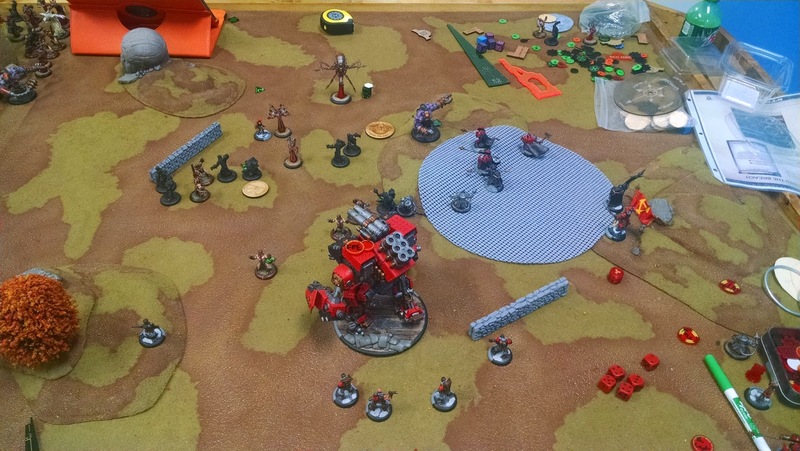 Irusk then pops his feat and charges the Machine Wraith, killing it with a boosted attack. He then casts Battle Lust on the IFP, who then use Iron Zeal and charge the Wrecker in the forest. Two make distance to attack and do around half it's grid in damage. Conquest advances slightly (objective in front of it) and fires it's Main Guns shot at the left Wrecker. The attack hits (no critical) and that hit is Shield Guarded by the Warden. The direct hit does 3 damage, while the blast damage kills the previously damaged TAC and forces a Tough check on another Drudge. The right Secondary Battery attempts to shoot at the enemy objective, but come up short, so the Left Secondary Battery puts down Creeping Barrage templates. The Widowmakers advance, with one provoking a free strike from the Machine Wraith (kills it,) leaving the other one engaged. The one free Widowmaker shoots a Drudge, who Toughs. 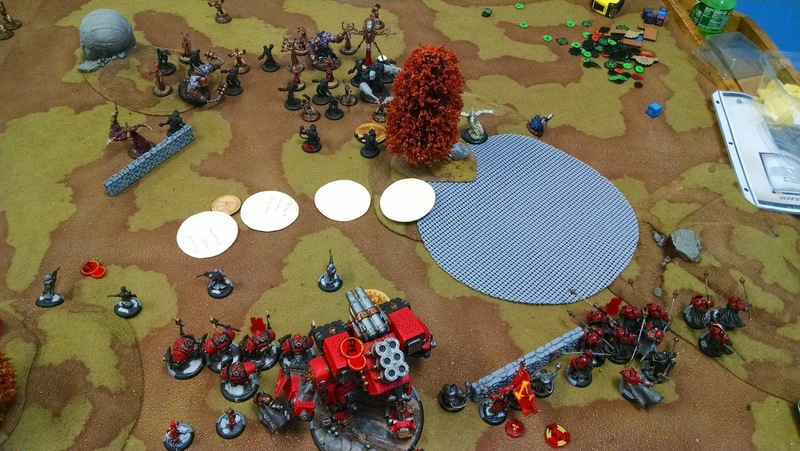 The left IFK gives Shield March to the Shocktroopers, who advance and kill a Drudge with their Shield Cannons and the Machine Wraith with a melee attack. The Eliminators reposition behind the Shocktroopers. Thexus allocates 3 focus to the left Wrecker and keeps the rest for himself. Thexus starts off the turn by advancing and popping his feat, moving Shocktroopers out of Shield Wall and shuffling IFP and Widowmakers around for follow up attacks. He then heals the broken arm on the right Wrecker and TKs the one Mind Slaver Drudge that is caught in Irusk's feat backwards, allowing the unit to receive orders. The TAC activate and throw out Flame Blasts at the Shocktroopers. The Blasts cause some damage to the Shocktroopers and kill one of the Widowmakers. The Mind Bender unit then activates and advances, with one of the Drudges making melee to a Shocktrooper. The punch does some damage, then the Mind Bender starts popping Drudges for sprays into the Shocktroopers, the remaining Widowmaker, an Eliminator, and the IFP. When all the sprays are done, the Shocktroopers have taken some more damage and a one IFP has been removed. On the right flank, the injured Wrecker and Overlords lay attacks into the IFP, killing a good chunk of them. The Pistol Wraith on that flank advances and attempts to shoot at the IFK, but misses it's first shot and does one damage with the second. 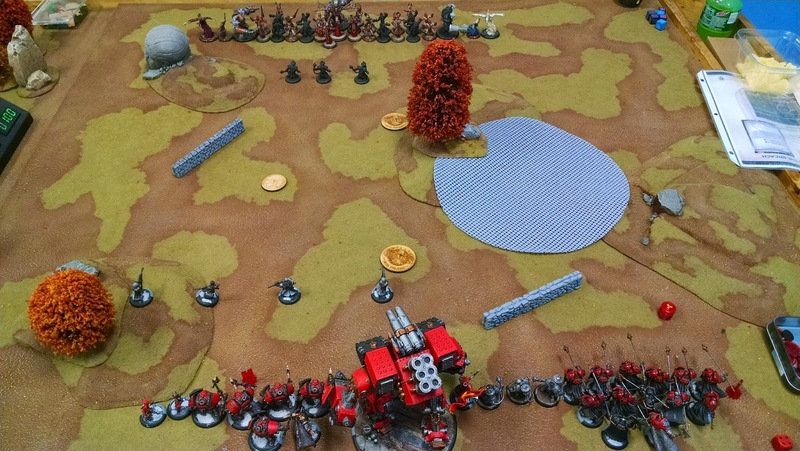 The Pistol Wraith on the left flank advances and tries to shoot Conquest, but comes up short. It's second shot goes at the remaining Widowmaker, but it misses. The Wrecker repositions to guard Thexus and the objective. Irusk allocates 3 focus to Conquest, upkeeps FFE, keeps the rest. Irusk backs up to get onto the hill, then casts Battle Lust on the IFP. The IFK charges the Pistol Wraith but whiffs. The IFP charge the Wrecker and the Pistol Wraith, killing both. The TAC advance and throw out Flame Blasts that cause a couple of casualties, most notably the Mind Bender Cephalyx from that unit. The remaining Shocktrooper charges the Agitator hanging out on the left flank, connecting and killing it. The remaining Widowmaker retreats to the nearby forest and shoots a Drudge, forcing a Tough check. The Eliminators charge into the Mind Bender unit and the Pistol Wraith, killing one Drudge and the Pistol Wraith. The IFK on the left flank charges the Wrecker, doing a chunk of damage. The Mechaniks move to free up Conquest while staying nearby for repair duty while Conquest walks around them and punches the Wrecker to death with it's initial attacks. It spends it's focus on two follow up attacks on a nearby Drudge, who man-mode survives with two Tough checks. Thexus allocates one to the Warden, keeps the rest. The Mind Slaver unit repositions to try and get back into CMD and get out of the way. The TAC advance, with one spiking a Flame Blast into a Mind Bender Drudge to catch an Elminator (kills the Drudge, does damage to the Eliminator,) and the other TAC punches one of the opposing TAC for some damage. The Drudges near the Eliminators make attacks at them, but miss. The Mind Slavers activate and advance into the Shocktroopers and Eliminators. The Drudges that attack the Shocktrooper kill it, but the attacks at the Eliminators miss. The Overlords activate and line up for sprays. One shoots into the Elminator melee, killing one of them (command check passes) and kills two Drudges. The other two line up shots on IFP and IFK and kill a few more IFP after Tough checks, while the IFK survives. The nearby Agitator lines up a spray on IFP and Irusk which kills an IFP but misses Irusk. Thexus repositions slightly while the Warden runs into the forest. Irusk upkeeps FFE, keeps all of his focus. The TAC attempt to Flame Blast the nearby Cephalyx, and miraculously one of them directly hits the Overlord in the forest, killing it. The IFP and IFK charge into the Overlord and Agitator, killing both. Irusk maintains his position on the hill but still in the zone. The remaining Eliminator charges the Dominator but misses her charging Combo Strike. Conquest advances back over to get near the Warden and the zone and fires off a shot that kills a Drudge and forces a Tough check on a TAC. The Secondary Batterys on the left side shoot the nearby knocked down Drudge, who continues to Tough. The Widowmaker shoots a Drudge and kills it. End of turn Irusk scores 2 CP for dominating the zone. At this point we've been going for awhile and my friend's clock is extremely low. He does what he can with the time he has left, but he can't line up anything game ending before the clock runs out due to Irusk's location and camp. Result: Irusk wins via Deathclock! Since we had some time after the timer ran out, we opted to play the game out to it's conclusion. 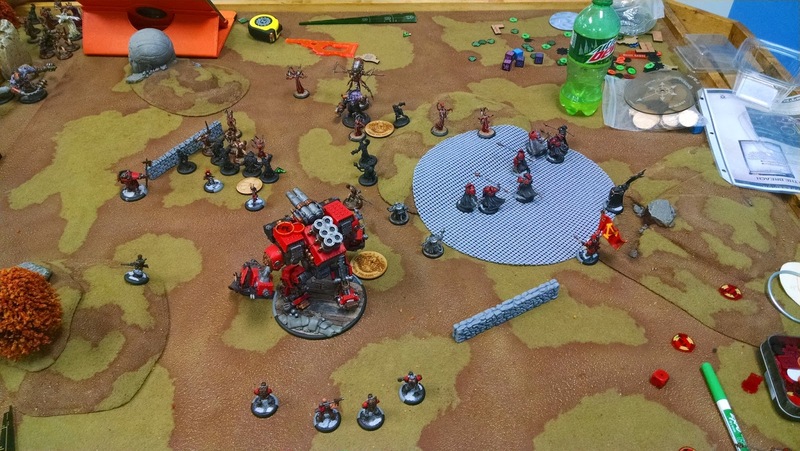 Thexus was able to score during his turn by killing the Eliminator and dominating the flag, but the next turn Irusk was able to clear enough of a path (between the Widowmaker and remaining TAC) to allow Conquest to stand near the flag. The IFP then killed the Warden, and from there Thexus couldn't do much to make a comeback. Two things played a big factor in this game: the scenario and the terrain. Also, I felt kind of bad about my feat turn. Not that it was tremendously effective (I actually think it was largely wasted but more on that later,) but my opponent didn't know what the feat did and so he ended up positioning in a way I don't think he would have if he knew what my feat could do. Ignoring clouds and forests allowed me to get in offense when he thought that he'd be safe, and while I don't think there was any way he could stop that from happening, I should have at least been clear about what the feat could do. My opponent also noted after the game that we kind of played casual Deathclock. There were many moments where during his turn I'd need a few seconds to bring up War Room in order to mark damage or check something, and we could have been switching the clock back and forth during that time. It wouldn't have made up the difference in clock time by the end of the game, but it is something to bear in mind. I know others have had luck with using War Room as their dedicated gaming resource when playing timed games, but I just can't see it (I'm on Android devices, which doesn't help.) In the future I'll be using cards whenever we play on time, just to get into good habits. I remembered to keep attention on the models that needed to be removed ASAP: TAC, Pistol Wraiths, Agitators. Granted, I didn't get a lot of chances to try to take them out (and it didn't always work out when I did) but when I got my chances I took them. The Cephalyx list is very reliant on it's non-grunt models for flexibility and efficacy, so its important to keep things like that in mind. I also managed to keep throwing crap at the various Cephalyx models and it paid off when blast damage picked up the Mind Slaver early. Killing any Cephalyx is a good thing, but that one is most important as it takes all that unit's utility and offense right off the table. I got lucky with the blast damage, but again the target priority was in the right place. Unlike previous games I managed to reign in my desire to fire the Eliminators off. It can be very tempting to just toss them out there and force your opponent to deal with them - and that can even be ideal with some lists - but I feel like that's kind of a waste with this brick. Now that the IFK gives the list a kick in speed, the Eliminators can hang back and serve more as problem solvers that pick off troublesome models or free up my guys. Plus if they're further back they're less likely to die to something silly and random, which makes it more likely that they'll be alive to actually do something useful later. Conquest managed to anchor the game nicely. I was worried about it getting punched off the table - Adrenal Flood'd Drudges can do quite a bit of damage and Wreckers are no joke - but it ended up in the position it works best in: hanging back, taking shots, then moving up to clear out what it can and hopefully live through the reprisal (backed up by Mechaniks.) By the time it had to get involved in the game there wasn't anything left that had a prayer of killing it, which meant I had a very strong model to put into contest the flag. Remember what I just said about Conquest? Part of that was not on purpose. One of the things I've had ingrained in me in my time spent working with Conquest is that it is not at all a vanguard colossal, a la Stormwall, Galleon, Prime Axiom, or Earthbreaker. If you try to make Conquest the centerpiece of your list, you'll probably end up disappointed. However, if you make it your (very, very large) anchor, you'll probably be happier with how it does. In this Irusk2 list, Conquest is absolutely supposed to be an anchor, and I pretty much can't help use it as anything else - Irusk2 only buffs it's shooting, not it's speed. That has served me well both games, as it's been an excellent model to have follow up after the already decently durable IFP and Shocktroopers. Due to this scenario, and my table side choices, I've run into the same problem: Conquest ends up near a wall and the objective, neither of which it can really get past easily due to SPD 4. In this game it was even worse as it ended up straight up boxed in, with no easy way to move quickly past the objective if I needed to. This is not at all a problem unique to Conquest, and it's kind of a fluke of this scenario combined with the terrain, but it's also something to bear in mind when deploying the big guy and moving him throughout the game. I need to be much more mindful of how easily boxed in Conquest can be if I'm not careful. The Shocktroopers were absolutely rolled over this game, as I sadly expected. Thexus is a 'caster that is wonderfully equipped to deal with them: he can TK models out of Shield Wall if he needs to, but he shouldn't even need that as his feat will probably move them all out of B2B and the Wreckers don't care one iota about Shield Wall (and with an Agitator nearby they're dice + 2 on damage, eesh.) This game highlighted their biggest issue: once they start getting shoved around (and/or their Shield Wall is ignored by something beefy) they can drop way faster than you want them to. As mentioned above, I feel like I almost completely wasted Irusk2's feat. I caught almost nothing with it (the Wrecker was the only model by the time everything was said and done,) and that ended up being a big deal during the following turn. I should have attempted to reposition Irusk2 with Energizer to get him a little further over, which may have allowed me to catch more models and force some harder decisions on my opponent's turn. I should not have Shield Wall'd up the IFP on turn one. I know that from playing years of Shield Wall models; even with Shield March you're moving a touch too slow. If your opponent has minimal threats coming your way (in this case, all of one Pistol Wraith) it's better to run to try and get better board position. Granted, that may have made it harder to pick off the Machine Wraith if it ran into jam me up. But running even just one or two more inches that first turn would have made the following charge on the Wrecker that much more devastating. If I had been able to get one or two more models onto it making attacks, it probably would have straight up died. As noted above, I need to be more mindful about where I position and move Conquest turn by turn. Walls and objectives are not your friends when you have a Huge base. Also as previously noted, I really need to work on getting better use out of Irusk2's feat. It can be kind of difficult to time correctly, and then you have Irusk's placement as an additional complicating factor. The TAC help a good bit with that (trying to move up safely without the cloud wall is very scary in the current state of the game,) but it can still sometimes be tricky to get him right where you need him, especially since he may also need to toss out buffs that turn. The IFP took hits like a champ. They were essentially the only thing I had on that right side and they managed to survive a healthy amount of punishment between Iron Zeal, Tough, and immunity to Knockdown. I don't even feel like I had a crazy run of Tough rolls with them and I still felt like they were an excellent wall. It has also been quite a while since I've used a Battle Lust 'caster, and this game reminded me of why that spell is so wonderful. Especially on BD IFP; being able to pick where those P+S 13 + 4d6 damage hits are going on the warnoun is fantastic. The TAC continue to impress, primarily due to their flexibility. Their cloud wall wasn't particularly necessary this game, so the TAC were able to wander around as a mobile hit-squad, whose extra attacks and templates helped quite a bit. They've earned their spot in my lists and their position in the painting queue. I'm definitely going to be keeping this list as-is for now. The biggest thing about using Irusk2 continues to be the need to feel comfortable using him and his list correctly. I'm not sure if it's an inherent difficulty with leveraging his abilities, my unfamiliarity with the list, something else, or a combination of all those things, but I always feel like I'm only leveraging a portion of what this list is capable of. A big part of it is positioning. A good bit of the efficacy of this list is being able to position for this turn and the next turn. Martial Discipline opens up many different formations and maneuvers, but it's not much of a benefit when you're not really using it that much. I feel like I can somehow leverage that ability more than I am now, and that I could also be positioning my models more effectively turn by turn. All of that takes practice, and I'm very much looking forward to getting more of that with Irusk2. I'll be back to report on any further games with him, likely with this list again. Until then, thanks very much for reading!